POLASCII project contains two versions: an Raspberry Pi version and a PC version. In the beginning, I was thinking using Raspberry Pi to make a hacking project to demonstrate on Maker Faire Shenzhen 2014. When dyne's hasciicam project came to my eyes, I thought about the idea of a combination of ASCII camera and a Polaroid, which can also get user an ASCII photo instantly. So on the Hack42 hackathon, I tried out a few things that I might be using: Raspberry Pi, RPi camera, the thermal printer, and the AA-lib. 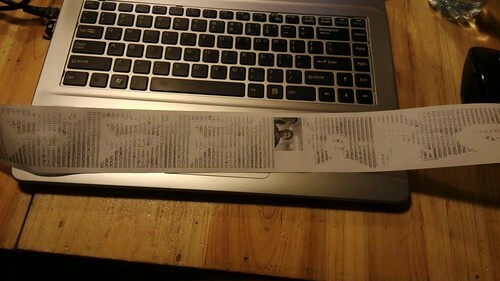 It's easy to use Debian on Raspberry Pi, so all I need to do is to find the library for capturing pictures from the camera, render them into ASCII characters, and then send to the thermal printer to print. On Raspberry Pi, there is a picamera for it's specific camera. 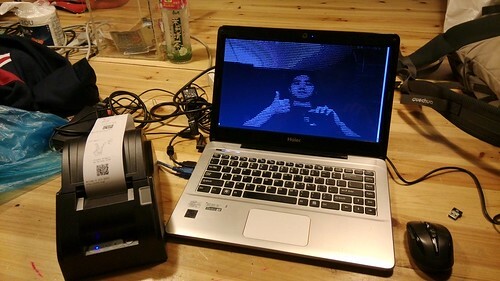 For the thermal printer, there is this python-escpos project which handles the printing interface. And the last, there is also this python-aalib which wraps up the C interface of linux aalib. However, I found out some serious problems: 1. the python-aalib running on RPi has bad performance, the rendering process takes nearly half a second, so I cannot get real time live show from the camera. (I didn't have time to investigate the reason); 2. The ASCII picture printed on the paper is too small to recognize things, while it takes too long to print a thumbnail pixel image. So I decided to switch to a PC solution with a web site hosting for holding the HTML ASCII image online. Extra work needs to be done. 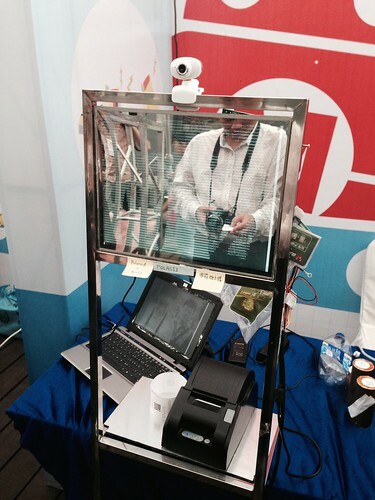 The picamera is not available on PC, so I search and found OpenCV's camera solution. It needs a conversion from OpenCV to PIL and the rest are the same. The web site needs an app that accepts uploads from the client. I just chose a simple and fast one "wheezy.web", which I never used before, and it's a chance to make a test. The original python-aalib only ports a subset of the features of the aalib. I'm not satisfied with only generating plain-text, but rather the more attractive grayscale html form. So I study the python-aalib source code and use ctypes to port more functions from aalib. Now the rendering and the uploading parts are ready, all I need is the python-qrcode that integrated with python-escpos to print a QR code for the link. So the final demostration is a monitor, a usb camera, a laptop and a thermal printer that works on Maker Faire Shenzhen 2014. Project Polascii, created by terryoy, 2014. Supported by SZDIY community.